What is a Green Team? 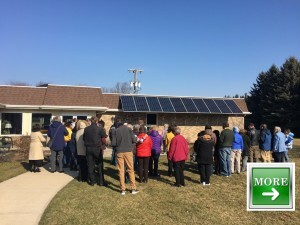 A Green Team can be called many different things, but basically it a group of individuals within a congregation who are committed to environmental responsibility and creation care. Starting a Green Team in your own faith community is a way to begin to make changes, while finding the support from others as you work to make a difference. Explore the spiritual guidance that your denomination may give around the environment. A good place to start would be our website page on Religious Teachings. Explain how being good environmental stewards helps you live out your beliefs. With energy efficiency and conservation comes potential money savings that could be used for other ministries. A Green Team has the potential to strengthen your community by bringing your congregation together. Worshiping together, learning together, solving problems, and creating something new as a community; discussing, debating, even arguing (respectfully, of course) to arrive at collective decisions; putting your time, energy, and skills to work for a better world–these practices reinforce the bonds that hold your congregation together and strengthen your capacity to change. A Green Team can encourage collaboration and relationship building. A Green Team can give you the experience of the effectiveness of collaborative relationships and the hope that emerges when you know you’re not alone. The work gives us satisfaction, but the relationships bring us joy. Formally invite folks who are current or past members of relevant committees, such as religious education, worship, communications, building and grounds, finance, hospitality, or social justice. Members need to have enough diversity of experience in congregational life to connect with the entire congregation. A well-written charter or purpose statement clarifies that the role of this team is to organize and facilitate the work. The entire community, not the team alone, is responsible for being engaged in environmental work. The team leads the effort by conducting the assessment, planning projects, providing resources and logistical support, and communicating with other leaders and staff. A key role of the team is to encourage participation in the program. In a sense, they are the congregation’s environmental cheerleaders. Hold information sessions to talk with the community about what the Green Team is doing and how others can be involved. Invite feedback and suggestions for projects from the community. Work collaboratively with other committees and staff. Do you have a good news story about a Green Team in your House of Worship? Share it with us so we can pass along your ideas to others.